To aid students of all ages to attain their education goals; address their desire for self-directed personal growth and development opportunities; and meet the need for information and answers to questions on a broad array of topics. The Alexandria Public Library was formed as the result of efforts made by the Community Council. The library was legally first opened on Thursday evening, June 13, 1935 in the township house (small building on West Main Street) with 524 books borrowed from the State Library of Ohio to use for circulation. On March 26, 1938, the library opened in the Shaub house (front of the lot where the present library stands). This house and lot were purchased in 1937 with money collected from subscriptions. The library needed a larger building and better facilities for serving the public. By 1961, the building fund had increased and, along with money allotted by the library from the intangible taxes by the County Budget Commission, it was possible to erect a new building on the lot. The house on the lot was removed and a new building 60’x32’ was erected. The cost was $38,430 including furniture. This building was opened October 7, 1961 and dedicated November 12, 1961. A workroom addition was added to the back of the building in 1964. The size of the room was 10’x20’. The building was again added to in 1972. Both the north and south ends were expanded, the heating and cooling systems upgraded, and more shelving added. The library was funded by intangible taxes until 1986, when the method of funding was changed by the State of Ohio. The funding now comes from the income taxes collected by the State with appropriations being made by the Licking County Budget Commission. 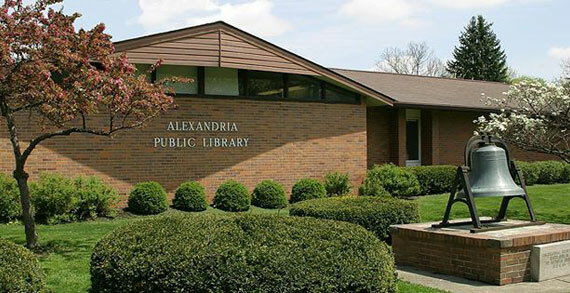 In 1968, the Alexandria Public Library joined other libraries in the county in the program of interlibrary loan service – where upon request, books could be borrowed from any library in the county for use by Alexandria patrons. Likewise, books were lent from the Alexandria Public Library to other libraries for similar use. This program was serviced by a mobile unit that visited the five public libraries and Newark’s four branch libraries in the county three times per week. In September, 2006, The Alexandria Public Library withdrew from cooperative interlibrary loan with Licking County libraries, and instead became a part of the Central Library Consortium. In 1974, a four drawer fireproof file cabinet was donated to the community and placed in the library by Drs. Hazel and Robert Price for the purpose of preserving historical papers with all items being accessible to the public. However, none of these materials are to be taken from the library. At the same time, a display case was given to the library by the Drs. Price to display historical books and items of interest. Over the years, many gifts of furniture, books, pictures, money and labor have been received from friends of the library. Books have been placed in the library as memorials by friends and relatives. In December 1976, the property immediately east of the library building on Main Street was purchased as an annex. This building was used for meetings and as the Historical Museum for a time. The Trustees decided to have the building demolished in 1984 due to the cost of insurance, taxes and repairs needed. The building was removed, the grade leveled and grass seed planted. This lot was to be used when needed for an addition to the library. During the 1980s it became apparent that increased circulation and participation in the children’s story hour were severely taxing the limited space available in the current building. In 1986, the Library Board decided to apply for Title II Grant which would provide an additional 1,833 sq. ft. The plan called for a meeting room on the north end of the building. This would give the children their own room for story hour and eliminate much of the confusion which occurred when story hour was conducted during the hours when the library was open to the public. In researching the requirements for consideration of a Title II Grant, it became obvious that the application, because of the complex requirements, could not be submitted until 1987. This was done, but the application for funding was denied. The Board then asked the Licking County Budget Commission for the funds necessary to remodel the existing building and to build the planned addition. The Budget Commission recognized the need and appropriated the money over a 12-month period. The project was completed in May 1989 – giving the library a total of 6,610 sq. ft. The total cost of the project was approximately $214,000. In 1989, the lot adjoining the north end of the library property, which contained a frame dwelling fronting on Church Street, was purchased from the owner, Kevin Stephens for $22,500. The house was burned in 1990 as a training exercise for Alexandria, Granville, and Johnstown Volunteer Fire Departments, and the lot filled and leveled into a lawn. Part of the lot fronting on the alley was made into a parking lot for the staff, and when necessary, patrons of the library. A sidewalk connecting the parking lot with the library was built in 1991. In December, 1990, the library received a gift of $5,000 from the American Bicentennial Presidential Inauguration Committee. A surplus remained from the Bush Inaugural in 1989, and by tax laws, had to be distributed to nonprofit organizations. Mrs. Barbara Bush suggested the money be given to libraries with no strings attached. With the help of the American Library Association, two libraries in each of the fifty states were selected to receive this surprise donation. The Alexandria Library used their money for an outdoor flagpole placed in the yard facing West Main Street, and to purchase a complete set of the Ohio Revised Code. Because of increased demand by the community for use of meetings and needed floor space for audio visual materials, in 1992 it was necessary to add a juvenile activity room and a new meeting room. (The former meeting room was incorporated back into the library service area.) Additional restrooms were required to meeting State building code. Wachtel and McAnally Architects were employed to draw plans for an addition to the building of approximately 1,740 sq. ft; bringing the total size of the library to 7,155 sq. ft. Final cost of the addition completed in the summer of 1994 was approximately $195,000. The Library is administered by a seven-member Board of Trustees appointed by the Northridge Board of Education. Each member is appointed to a seven-year term with one term expiring each year. A number of people have given their time on this board as trustees. The first Library Board members were: Rev. McMillen, Rev. Smith, Frances Johnston, Oliver Carroll, Maimie Tyler, Walter Castle and Robert Price. Library Board presidents have included Glenn Davison, Olive Carroll, Lester Mitchell, Margaret Herreman, Robert Nichols, Nancy Baker, and Deirdre Schedwin who has been president of the Board since 1987. The library had volunteer librarians for some time, Leona Smith being the first, followed by Fred Fleming and Nellie Fisher. Helen Dumbauld was the librarian from 1952-1986. Linda Schneider served as Director of Library Services from 1986 – 1994. Dorothy Hannahs served as Director from 1994 – 2005. Denise Shedloski is the current Director of Library Services. In 1992, a contract was signed to join the Newark Public Library in the Dynix Automated Library System. The Granville Public Library also joined. By December of 1994, all holdings had been entered into the system and the joint contract continued uninterrupted until September, 2006, when Alexandria Public Library withdrew from the Newark library cluster to join the Central Library Consortium which is formed of several Central Ohio public libraries of various sizes including: Grandview Heights, Fairfield County, Marysville, Pickerington, Pickaway County, Plain City, and Wagnalls Memorial. In May, 2013, Columbus Metropolitan, Southwest Public Libraries and Worthington Public Libraries will join the Central Library Consortium. This partnership results in 11 library systems serving 1.4 million residents across six counties with nearly 1.2 million unique titles. In 1996, the library began providing Internet service to patrons courtesy of Ohio state government-supplied computers via the establishment of OPLIN (Ohio Public Library Information Network). OPLIN also allowed all 250 public libraries in Ohio to connect to the internet at no cost to any individual library. In 2005, two new computers were purchased by the library to replace the State’s hardware, although OPLIN is still funded through the State Library of Ohio. In 2007, two additional public internet access terminals were added bringing our total to four computers. Today, the library offers internet access, word processing programs and on-line databases and catalog. The library is staffed with a full-time director; part-time children’s coordinator, young adult coordinator, adult services coordinator, cataloger, janitor, clerks and pages. Maintenance and landscaping are contracted outside the library with local vendors. Online technology has added resources for our patrons and made materials easier to locate and borrow both from our own collection as well as through our Consortium partners. Programming has expanded to include an adult book club, monthly adult programming, and bi-monthly young adult activities in addition to regular weekly children’s programming. As of December, 2012 the Alexandria Public Library can be proud of our 4,005 patrons, our 53,918 items (printed materials, CDs, DVDs and periodicals), annual in-house circulation of 61,589 and annual interlibrary loan circulation of 18,113.